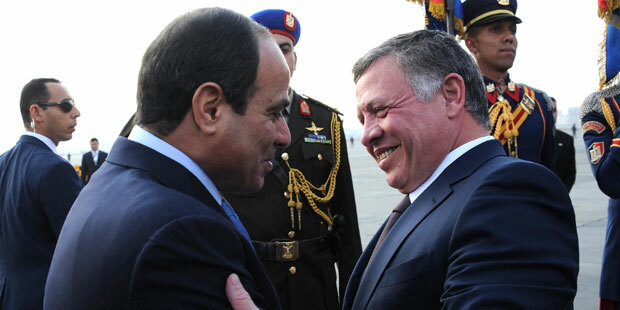 King Abdallah of Jordan and Egyptian President Abdel Fattah el-Sisi discussed in Cairo “ways to push the stagnant Middle East peace process” in light of the position of President Donald Trump’s administration. The meeting between the two leaders came days after Trump stated that there could be other means to settle the Israeli Palestinian conflict other than a two-state solution during a joint press conference with Prime Minister Netanyahu of Israel. 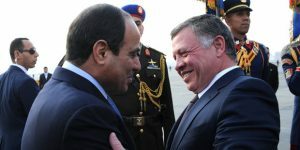 A statement released by the Egyptian presidency after the meeting between Abdallah and Sisi underlined that the two leaders have agreed to have a “mutual coordination to reach a two-state solution and establish a Palestinian state based on the June 4th 1967 borders with East Jerusalem as a capital, which is a national constant that cannot be given up.” The two leaders are considering their position as a “fixed national principle” that could end the more than 50-year old conflict. Amman and Cairo are considered as key mediators in facilitating an agreement between the conflicting sides because of their political relations and territorial borders with the two states. The shift in Washington policy under the presidency of Donald Trump is expected to be challenged by Arab countries in the Middle East that are all strong supporters of the establishment of an independent Palestinian State. The ruling coalition right-wing Israeli government welcomes the Trump administration as a pro-Israel government and has since embarked on making numerous settlement announcements in occupied Palestinian territories. Trump’s plan to move the American embassy to Jerusalem from Tel Aviv was widely applauded by the right wing Israeli political parties although the international community warned that it could further complicate the volatile situation in the region.